Mustafa and his family traveled a long way to reach their new home. Some nights Mustafa dreams about the country he used to live in, and he wakes up not knowing where he is. Then his mother takes him out to the balcony to see the moon -- the same moon as in their old country. In the park, Mustafa sees ants and caterpillars and bees -- they are the same, too. He encounters a "girl-with-a-cat," who says something in a language that he can't understand. He watches an old lady feeding birds and other children playing, but he is always looking in from the outside and he feels that he is invisible. But one day, the girl-with-the-cat beckons to him, and Mustafa begins to become part of his new world. 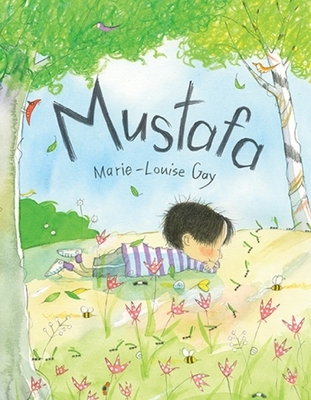 Marie-Louise Gay's remarkable ability to write and illustrate from the perspective of a young child is movingly exhibited in this gentle, thoughtful story about coming to feel at home in a new country.